“According to the most recent MFL report by OFSTED, intercultural understanding is weak in the majority of schools and it is not necessarily integrated in every lesson”, commented Suzi Bewell, PGCE MFL course leader at York University, during her inspirational workshop on the importance of intercultural understanding. · “Combine global citizenship with languages”: One strategy for increasing intercultural understanding in the classroom is to combine global citizenship with languages by: teaching language learners the rights of the child (see UNICEF, Trocaire Global Storysacks,); exploring global justice issues in language education; see this fantastic site for accessing 50 plus free resources in French and Spanish. · “Generate debates on the differences and similarities of different cultures around the world”: using provocative photos (e.g. Peter Menzel’s photos from around the world) to generate discussions on all aspects of cultures, such as what we eat ‘Hungry Planet: What the World Eats’, or what our belongings consist of on ‘Material World: A Global Family Portrait’ and different schools around the world ‘Ecoles du Monde’. · “Involve your learners in supporting global campaigns”: such as the ‘Send My Friend to School’ campaign that brings together hundreds of thousands of students and teachers in the UK who want the government to keep its promise and make sure that every child can go to school, no matter where they live in the world. Plan International’s gender equality campaign affecting children’s education (in Spanish). · “Creating partnerships and making connections with schools abroad”: through the use of Skype with classrooms abroad; through finding penpals around the world; sending and receiving postcards from random learners around the globe (see Phipps & Gonzales 2004 book on Modern Languages learning and teaching in an intercultural field). · Links Into Languages: Ideas, inspiration and materials for language teachers on the Links into Languages website, including a series of resources for teachers of primary, secondary and post-16 languages. · Mary Glasgow Magazines are a specialist language publisher based in central London. Mary Glasgow Magazines’ team of dedicated writers, editors and designers publish magazines, books, audio and a website aimed at secondary school students learning languages. · MYLO is a free KS3 and KS4 language learning resource developed for the Department for Education and run by RM Education. It offers a new way to learn French, German, Spanish and Chinese. · Rachel Hawkes is Director of Language College at Comberton Village College, a comprehensive secondary school in Cambridgeshire, where she has worked since 1999. Her website contains resources, ideas and strategies for promoting, teaching and learning languages. It is hoped that they will support Heads of Languages and teachers of Spanish, German and French. · “Collaborative planning: plan, trial, reflect, evaluate then refine. If we want to ‘mine for gold’, then this takes time and effort”. Through years of watching the responses of children to inform her planning, Liz has changed her style of teaching in order to create a high level of interaction in the classroom and to make language teaching more meaningful for students. “Children feel treasured if they see that you have planned a session for them - taking their own needs into account”. · “Spend time with colleagues at key transition stages”: How much time do we give to receiving our pupils? Understanding how children have been taught in previous years, and their attitudes to learning, before they come to your class is very important. The terminologies used by teachers in different key stages vary. For example, in KS1 the imperative may often be called the ‘bossy language’, in KS2 the ‘command language’, in KS3/4 it is called the ‘imperative’. Look at the core blocks: as a receiving teacher, what do you hope they are going to come to you with? What will you do to ensure the learning journey is improved? · “Motivate students to think, express opinions and debate at a young age”: create spontaneous talk by asking them to say whether they think certain situations are fair or unfair; create a comfortable space where there are not rights or wrongs; show videos (e.g. The Star Thrower) or sequence of photos; use poetry; “learning is at its best when material used is exotic and unusual”; use engaging context and material that provoke meaningful conversation, that make students laugh or moves them emotionally; exploit their chatter “you can still teach traditional themes, but in their real world”. · “Use models of famous people that inspire students in the classroom”: such as Paul McCartney singing in German; Joanna Zimmer; use the local context by identifying ‘local heroes’, positive role models or people that students admire and invite them into your classroom. · “Consider some more radical approaches”: e.g. cross-phase teaching, older students teaching younger ones in family groupings. Cascading learning is powerful. Research ‘Storyline’ and how effective this could be for MFL teaching. I attended a truly stimulating and inspirational Language World 2012 conference in Manchester this weekend. Session after session, talk after talk, I felt the motivation, commitment and passion of speakers who spoke of their experiences as modern language teachers, sharing strategies and creative techniques of how best to engage students in learning languages in fun and effective ways. · “Create an enquiry-based approach in students”: Engage the learner at an early stage with noticing. Why are some word constructions different? Why are there exceptions? For example, notice how in this example some words end in with French plural ‘s’ and some words don’t: “Les yeux bleus, les yeux d’amoureux; Les yeux verts, les yeux de vipere; Les yeux marron, les yeux de cochon”. · “Grammar isn’t driving the learning alone, it is the meaning and interaction that is driving it”: The learner must engage and identify with the language. Stories should provide stimulating and exciting contexts for students. Teachers must make meaning through the language driven by the motivation of the students themselves. They should enable students to see the world in a broader sense, learn about other countries, other ways of life and at the same time learn about important current issues, such as sustainable development – as in the case of the story of the multi-lingual architect Francis Kere who has built a school in Burkina Faso; or football; or art, such as the Frida Kahlo example, “using paintings as stimulus for all kinds of discovery”. · “Create spontaneous talk in the classroom”: using current news on a regular basis and selecting items chosen by the learners themselves goes a long way to generating spontaneous conversations in the classroom. Use pictures effectively to build and construct. · “Teach disciplines through language”: such as ICT, sustainable development, and geography, i.e. ‘understanding volcanic activity’ or the human aspect of geography around the world, such as ‘Haiti: témoignages d’enfants des camps’ (UNICEF Television). · “Create transferable language skills in the classroom”: Why not offer learners to read the same story in different languages? By cracking the code of one language it helps them crack the code of another. These were just some of the wishes written on pieces of paper and stuck on as leaves on the Tree of Life for 2012 by homeless people at the Crisis Dependency Center in London this Christmas – a temporary shelter set up for those with drug or alcohol dependencies. Christmas can be a very lonely and depressing time for people who are homeless or living in hostel accommodation. For the past 40 years, Crisis at Christmas has helped alleviate that loneliness, by providing vital companionship, hot meals and warmth, and a wide range of essential services that homeless people often miss out on. For many, being in contact with others at these centers is the first step to leaving homelessness for good. So this Christmas John and I decided to do something positive – and set aside two days of our busy schedule to volunteer for Crisis, by offering to train, support and motivate the guests on how to solve puzzles - from crosswords, to word games to Sudoku and a range of other puzzles. On the morning of 27th December 2011, we arrived at the Crisis Dependency Center near London’s King’s Cross station armed with numerous puzzle books kindly donated by Puzzler Media. After a briefing by Crisis coordinators, we began to mingle and start conversations with the homeless people, or guests, by asking them if they liked puzzles and if they would like to solve one together. We met some amazingly courageous people, heard some of the most poignant stories, and were given a touching insight into the lives of the guests. Over the two days, I had some meaningful interactions with various people. I helped motivate one of the guests to complete his first ever Sudoku puzzle. He had tried many times, but had given up every time, and was so happy that he actually completed one – giving him the much needed confidence and opening doors for other opportunities which he could complete on. I met a long time heroine addict who so desperately wanted to quit his habit for good, and I connected him with one of the Crisis Skylight Ambassadors – reformed addicts, now volunteers with Crisis, informing guests of the opportunities and assistance provided at the Crisis Skylight Center in Spitafields, London, and other areas. I was taught by a guest so savvy with numbers and mathematics, how to solve a range of numeracy puzzles. 'Forget Sudoku, that is just a child’s puzzle compared to these other ones’ – giving him the opportunity to see what a great teacher of numeracy puzzles he could be to adults as well as young people – building the confidence and helping open doors to other possibilities. Small acts, with the hope of creating big changes in their lives. Small ripples hoping to make big waves in 2012. John and I loved the lively, positive atmosphere at Crisis. We were swept by the friendliness and enthusiasm of the other volunteers and coordinators and by the commitment of so many guests for a better future. We will be volunteering again next Christmas, and hope to see some of the guests we befriended again at Crisis…but this time as volunteers – or even better, as Skylight Ambassadors. I myself graduated from SOAS in 1997 with an MA in Area Studies, and remember the radicalism in international issues, the heated debates and student activism even back then. I was very happy to re-visit the School and to see that SOAS has not changed, and still continues with its strong student activism and direct action. I felt this energy throughout during my visit and my talk. There were student union elections taking place this week at SOAS with posters and messages of various candidates throughout the student’s union meeting room. Without doubt, this is an important year for elections with an even more important role for student union reps in a climate where specialist colleges like SOAS are threatened with the removal of all funding for teaching due to fees and cuts being imposed by the Government. Thank you to Debra Stanislawski for inviting me give this talk and help raise the profile of the work of PBI and the courage of women human rights defenders PBI accompanies. Debra is also a PBI colleague who’s worked in Nepal and who is currently studying an MA in Human Rights Law at SOAS. Maggie, Gauri and I are all united by a passion for telling stories, and using creative storytelling to benefit our local communities. We strongly believe in the ability of stories to heal people, from the young to the elderly. We met last summer while participating in the course ‘The Storyteller at Play’ led by the International School of Storytelling in East Sussex. Since then a conversation filled with growing interest and passion, and an exchange of an idea with the prospect of creating positive change, grew from a small seed to lovely budding flower this week. We hope this flower will grow and multiply in the coming months. This project involves running creative storytelling sessions with elderly people with dementia, an activity I had started with Alison in 2008. This week, we ran our first creative storytelling workshop together with elderly people with dementia in Eastbourne, using the TimeSlips method. Here are the two stories that were created by the group. This is taking place in some country - it could be either Istanbul or Reading Wood. They are horses with long necks. 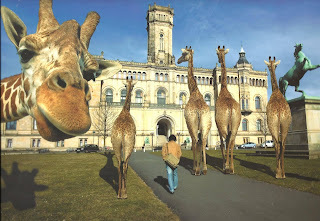 They are giraffes, and they make ‘tchk, tchk, tchk, tchk’ noises. They are going horse racing, and are waiting to have lunch as they meet their mother. They are also waiting for their photos to be taken. They are growing so tall, they could jump high! They are waiting for tea. If all the windows open up, they could put their heads inside, then they could find something to eat. One giraffe said, ‘Hello! Go spend a penny on a cup of tea!’. How does a giraffe spend a penny on a cup of tea? Finally, after the cup of tea, they have another one and decide to have yet another one. They are waiting for the cup of tea but it never arrives. The man sits quietly, not bringing the cup of tea. They can’t get out of the picture. He is called William Thomas. He is a very pretty boy. He doesn’t look much like my dad. He’s blowing a trumpet of some sort, but it’s too big for him. 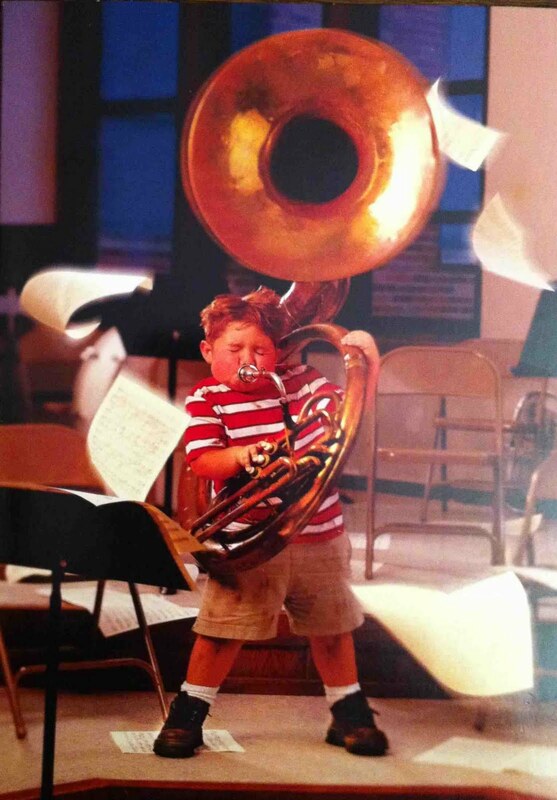 He’s got to shoot up and get bigger to be able to hold the trumpet well. He’s here at Milton Grange. It’s a living room of some sort. It is too much of a mess. The trumpet is making a ‘do, do, dooot’ noise, but it should be louder than that. It should be ‘DO, DO, DO, DO, DOOOT’. Louder! His mum is thinking that he’s wetting his trousers and the neighbours are thinking the same thing. The neighbours wished he played something quieter and that he was less smelly! He’s blowing so hard, the music papers are flying all over the place, or it must be a bit windy in that living room. It is the noise of the wind that makes the music. He’s not reading the music, he’s just playing the trumpet. When he finishes playing, he will go and find some very pretty girls or he might be flat out and go to sleep. If pretty boy can play music, he can also find some very pretty girls! We thank Ann, Barbara and Barbara, Bill, William, Mary, Sylvia, Winifred (Win), Maria, Angelica, and the support of Carol, Sheila and Grant, for their participation and creativity. Election Observation is the fifth objective of the European Instrument for Democracy and Human Rights (EIDHR), and the analysis of human rights and gender issues is a recurrent element of European Union (EU) Election Observation Mission (EOM) reports. At this year’s EU Observers Forum, held in Brussels 1-2 December 2010, an interesting discussion took place on how EOMs can make a better impact and positive change on human rights and gender issues in the countries they observe. "As observers, we need to keep asking the question about the role of women in the political process in all countries we observe in", stated Fiona Hall, Liberal Democrat Member of the European Parliament and a member of the Election Coordination Group - a body of MEPs who decide on which elections the EU should observe in. She was the Chief Observer of the EOM in Togo and in Mozambique this year. "Why do some countries not have a quota for women in government? Why are women so under-represented in political systems? Why are there not enough women manning polling stations? We may think that this is not our role as observers, because it is not our election, but it is important to ask the question to force a discussion, to make government officials address such questions." The question of gender equality in political and electoral processes has to constantly be on the agenda. Through these questions we also need to consider why are women under-represented in these processes? How can we ensure meaningful participation and equal opportunities for women by making sure that the right legislative and electoral frameworks are in place?It is relatively easy to fill quotas but it does not say anything about the empowerment of women. It is not just about ticking the boxes, we need a more holistic approach. There are a number of examples where women are beginning to run the show in politics, the most powerful example is the case in Rwanda, where its parliament became the first in the world where women claim the majority - 56% including the speaker's chair. "Rwanda has banished archaic patriarchal laws that are still enforced in many African societies, such as those that prevent women from inheriting land. The legislature has passed bills aimed at ending domestic violence and child abuse, while a committee is now combing through the legal code to purge it of discriminatory laws", as referenced in Stephanie McCrummen's article published in the Washington Post in October 2008. The unusually high percentage of women in Rwandan government is in part a reflection of popular will in a country of 10 million that is 55 percent female. Such changes can only be enforced through political will, which is sadly lacking in many other developing and developed countries. The EU is committed to turning EOM recommendations into practice, and supporting the implementation of these recommendations through the provision of technical assistance to countries. There are a number of technical assistance projects funded by EIDHR, who finance civil society organisations directly (CSOs) or via 90 country delegations. How can these links between the EOM Recommendations and technical assistance to NGOs in human rights and gender equality be strengthened? The EU currently funds over 40 projects in democratising electoral processes, and in increasing participation of women in electoral processes - including participatory media projects, civic awareness training to increase capacity in active political participation, and participation of women, youth and indigenous groups as local observers, these are just some examples amongst many others. For a full compendium of projects implemented between 2007 and 2009 in human rights and democracy, see EIDHR's report here. The role of international governments and CSOs is an important one in ensuring governments have the political will and are held accountable to enforce positive changes. How could we enhance the participation of CSOs before, during and after electoral processes? During these discussions, Fiona Hall raised a poignant question, "What happens at the end of election observation missions? Often human rights abuses take place at the end of the mission after an election, such as in the case of Kenya, and often there are no other mechanisms in place which work well in ensuring human rights violations are brought to case. We don't yet know how external action would work, whether Head of EOMs should play a more political role or not", added Mrs Hall. Without doubt we can't underestimate the importance of political dialogue, and the role of international governments and CSOs in making governments accountable for human rights violations beyond EOMs. Observing elections contributes to the promotion of human rights and development, but there need to be in place more robust and long-lasting mechanisms to oversee human rights and gender issues beyond elections. Political participation is the basis of democracy and a vital part of the enjoyment of all human rights. 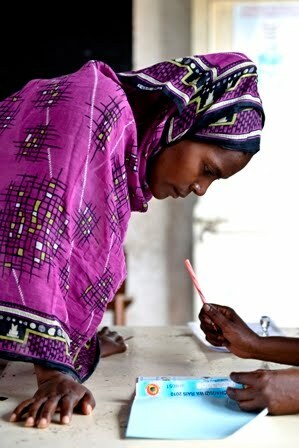 EOMs play a crucial role in enabling the right of all people to vote in elections - one of the most fundamental of all human rights and civil liberties - by ensuring that elections in developing countries are transparent, fair and by building the capacity of governments through election assistance support. However, there also needs to be more an effective, holistic and robust system in place supported by international governments to oversee human righs, gender issues and democracy beyond elections. However, without political will at the national level in countries, it will be a struggle to create and put into practice such systems.